﻿ Best Price on SunBreeze Suites in San Pedro + Reviews! 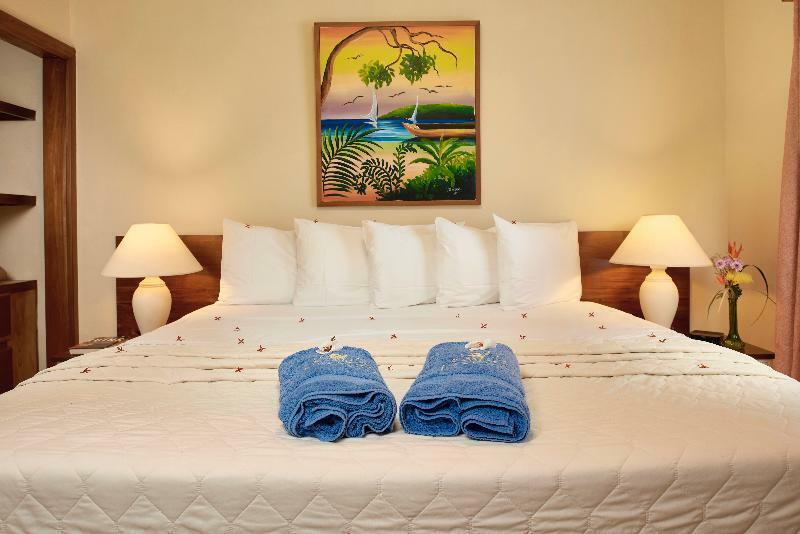 Offering a freshwater pool, patio bar and free WiFi in common areas, SunBreeze Suites is set on the beach on the tropical island of Ambergris Caye, just steps from the largest Barrier Reef in the Western Hemisphere and UNESCO world heritage site. Each suite has a balcony overlooking the sea, a bedroom, bathroom and a living-dining room with a double size futon and cable TV. All Suites are non-smoking. The well-equipped kitchenettes feature a hob and fridge. Located in central San Pedro, the complex is within a 5-minute walk of many supermarkets, gift shops and open-air restaurants. San Pedro Airport is only 0.6 mi away. Staff can arrange island transfers and help you plan excursions throughout Belize. SunBreeze Suites offers barrier reef dives and dives to the world famous Blue Hole through the services of the dove operator. Please inform SunBreeze Suites in advance of your expected arrival time. You can use the Special Requests box when booking, or contact the property directly with the contact details provided in your confirmation. Guests are required to show a photo identification and credit card upon check-in. Please note that all Special Requests are subject to availability and additional charges may apply. The staff at Sunbreeze Suites promptly answered questions in the months leading up to my stay. They also updated me about Hurricane Earl, which passed through the week before my scheduled stay. I was provided with an invoice/outstanding balance summary until my balance was paid in full. I was never asked to pay a cent more. It was optional to open a hold on my account once I arrived - I chose not to and was not asked again. This was refreshing. Maid service was excellent; we chose not to have our room cleaned while we were there but our maid accommodated our requests for clean towels, etc. The front desk staff was the best; they helped us rent a golf cart and book our flights through Mayan Air - at a discounted rate. I loved the central location, walking distance to convenience/grocery stores, restaurants, etc. This hotel also happens to be located right next to the pier where many excursions leave from. I would stay here again and again. We really enjoyed SunBreeze. It isn't fancy but it was clean and comfortable - a good value. We were glad to be centrally located close to the airport, the tour operators and the ferry. It was also easy to walk out to many restaurants and stores. Though we were in the center of town, it wasn't noisy. Everyone was very welcoming and helpful and quick to respond when we had a request. I would stay here again and would recommend it. Suites - big living room, with sofa, TV, kitchen and balcony overlooking the sea. The furniture would need update, since its bit to old and worn out. The bedroom, good size, with en suite bathroom, comfortable beds and pillows. Restaurant - serving breakfast, lunch and dinner (not included in room rate). The quality of food was good, but nothing special. Swimming pool - small swimming pool next to restaurant, overlooking the sea. The size its pretty small, but always plenty of space, since almost no one used it. Location: great, next to the sea, however its not suitable for swimming and sunbathing due to many boats passing. Many options of dining around, supermarket 2 min walk, and airport 10 min walk, diving shops in front of the hotel. Dislike: WiFi (in our room didn't work), worked only at the restaurant or around the pool. We requested to change the room upon check in since we found out, the WiFi dosnt work. But they didn't moved us. Instead they tried to restart the internet and call IT to have look at it. But it never worked during our 5 nights stay.